Lena T. Durnein, 87, formerly of 14 Woodlawn Ave., Bradford, passed away Saturday, August 11, 2018, at The Pavilion at BRMC. Born October 7, 1930 in Bradford, she was a daughter of the late Dominic P. and Susan (Accurso) Luzzi. She was a 1950 graduate of St. Bernard High School. On July 16, 1955 in St. Bernard Church, she married William F. Durnein who passed away March 12, 1988. She had been employed at Dresser Manufacturing for a while, became a homemaker after her marriage, and later owned and operated Bottle O' Beer with her husband Bill. 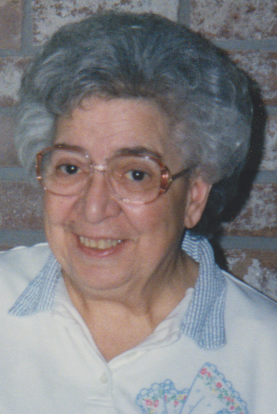 She was a member of St. Bernard Church and a member of the Catholic Women's Club. She is survived by three children, two daughters, Susan Peters, of Hershey, and Ann (Steve) Livingston, of Bradford, one son, Francis (Christine Miller) Durnein, of Bradford, two brothers, Salavtore Luzzi, of Bradford, and Louis (Jane) Luzzi, of Bradford, five grandchildren, Francis, Beverly, and James Durnein, Matthew and Megan Peters, and several nieces and nephews. She was preceded in death by her parents, husband, four brothers, Dominic Joseph, Alfonso, Michael and Anthony Luzzi and one sister Josephine M. Luzzi. Family will be receiving friends on Monday, August 13, 2018, from 4:00 to 7:00pm in the Hollenbeck-Cahill Funeral Homes, Inc. 372 East Main St., where a prayer service will be held at 9:30am Tuesday, followed by a Mass of Christian Burial at 10:00am in St. Bernard Church with Rev. Raymond Gramata as celebrant. Burial will be in St. Bernard Cemetery. Memorial contributions, if desired, may be made to St. Bernard Church PO Box 2394 Bradford, PA 16701 or St. Bernard Elementary School. So sorry to hear of your loss. I had known Lena since I lived next door to her on Poplin Ave. she was the first to babysit me as a child. Loved her. Lena was a joyful woman! When she volunteered at SBS, she would sing “ you are welcome, you are welcome’ when someone told her thanks. Prayers to her beloved family! Susan, Frannie, & Annie and all the family, I wish I could be there with you all as you mourn and celebrate Lena. The picture you''ve chosen is how I''ll always remember her. Quick wit, quick to laugh, and no nonsense. Loved her spirit. Know I have you all close in my heart and in my prayers. Much love, J.
Susan & family, so sorry for the loss of your mother. You are in my thoughts and prayers. Anne so sorry for your loss .... you and your family are in my thoughts and prayers. Anne , I’m so very sorry for your loss. I’m thinking of you. You and your family are in my prayers ?????? Sending prayers and love to all of Lena''s family. She was a great lady and she will be greatly missed by many. ??? Dear Annie, How grateful I am that I was able to visit with your mom when I came to town. She was one of a kind, such a sweet, lovely person. How wonderful she is reunited now with your dad! Thinking of you and your family. Hugs and love to all of you!